Group drumming and percussion are fun rhythmical activities that cause you to relax, reduce stress and have fun! Follow the menu links to your area of interest and see ways to hear and feel how rhythm can brighten your life and connect you with the people you are responsible for. When you have discovered some of what we do with drums, visit the Contact page to find our details and then get in touch to find out more! By the time you have started to discuss how we can help, you will be well on the way to a successful event. Drum Circle? What does that mean? We provide various kinds of rhythm activity and many are based around the drum circle. So, what is a drum circle? Drum circle, drumcircle, drumming circle, drumming workshop, percussion group (even bongo drumming) - whatever you call it, a drum circle is literally a circle of from just a few up to hundreds of people playing mainly hand drums and percussion instruments. They can be absolute beginners or experienced drummers and are led where necessary by the facilitator to have fun creating improvised rhythms. What if I don't have any rhythm? 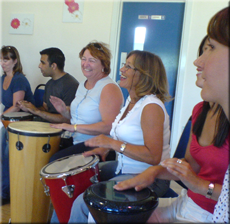 People can take part in our rhythm sessions at any level because drumming is fun and easy! Even the most reluctant can see clearly what to do and they soon feel they are making a valuable contribution as they hear the group drum song develop. It only takes a few minutes for a beginner drummer from first touching a drum to be joining in and fully immersed in the excitement of connecting with others and creating music together. Everyone's heart has been beating since before they were born - so we all have rhythm built in and just waiting to be expressed. 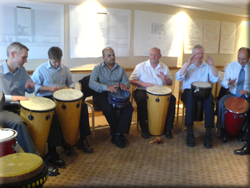 Try to resist taking part in one of our drumming workshops and you will realise why they are so effective for teambuilding exercises, as a conference energiser or party ice-breaker. Interactive corporate entertainment that is useful and fun! What makes your rhythm activities different from African drumming workshops? A facilitated drum circle is distinct from specific cultural activities such as African drumming, Samba band, Taiko drumming etc where participants have to learn parts and the emphasis is on getting it right. 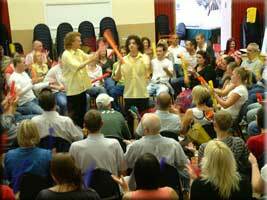 In an Active Rhythmology massed Boomwhackers, drum workshop or drumming circle, beginners or advanced players make up the unique group song together as they go along, helped by the occasional simple direction from the facilitator. It is all made up in the moment, so there can be no mistakes and the drummers soon discover how to make their own contribution to the rhythm. The rhythms that make up the typical 1 to 2 hour drumcircle can be of high energy driving beats or tranquil waves of sound - each lasting for a few minutes or half an hour, it all depends on what the group lets out. All our rhythm events are fun and educational - you tell us what the emphasis needs to be. One of the things people learn is how to work together and to do this they first have to listen and respond. They automatically want to make the improvised music sound better, so without realising it they adjust their playing and their relationships to one another. 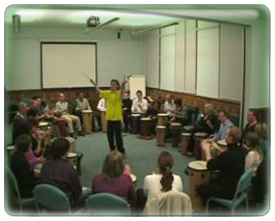 The mixed sounds of a drum circle co-operating to make a harmonious whole is a great metaphor for the benefits of team work building in real life - which can be pointed out in a training exercise if appropriate. From school workshop, through family fun day, wedding party and business away day to indoor corporate team building game we use the same basic principles of letting rhythm connect people - although our presentation style varies to suit your situation. We are based in Leeds and are happy to rhythmologise your group wherever you are in the country so if you want to use drums, percussion or Boomwhackers to energise, build rapport, educate or simply have fun please contact us for a free quotation. Based in Horsforth on the north west edge of Leeds, Active Rhythmology is ideally placed to cover Leeds, Bradford and the surrounding North Yorkshire, East Yorkshire, South Yorkshire and West Yorkshire towns and cities of Harrogate, Wetherby, Ripon, York, Selby, Castleford, Pontefract, Wakefield, Barnsley, Dewsbury, Huddersfield, Brighouse, Halifax, Keighley, Skipton and Ilkley. Good road routes also allow easy access to Kingston upon Hull, Scunthorpe, Doncaster, Rotherham, Sheffield, Nottingham, Derby, Stoke-on-Trent, Stockport, Manchester, Salford, Warrington, Liverpool, St. Helens, Wigan, Bolton, Oldham, Rochdale, Blackburn, Burnley, Preston, Southport, Blackpool, Lancaster, Morecambe, Kendal, Thirsk, Darlington, Stockton-on-Tees, Middlesbrough, Whitby, Scarborough, Bridlington and surrounding areas. Active Rhythmology do travel all round England, Wales and Scotland - so if you are in London, Birmingham, Newcastle, Cardiff, Edinburgh, Glasgow or anywhere else in the UK we can make your event fun, memorable and interesting - just pick up the telephone or send an email so we can talk about planning for your success.